The Croatian Post is one option but not your best bet! If you want to send a package in Croatia, you can go to the post office of course, but this is not the only option -- there are others. You can also head to your local kiosk... or to the bus station! Unfortunately my experience of the Croatian postal service has not been very positive and it is not the most reliable or fastest way to send anything. So luckily, there are these other options. First I'll tell you about the kiosk. Sending packages from a kiosk is a new service recently launched by Tisak Media. 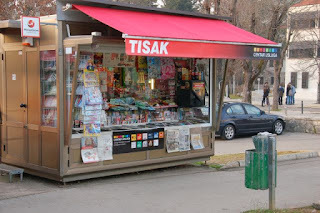 In case you're wondering what a kiosk is, these are the little enclosed stalls you see in Croatian towns and cities selling primarily newspapers and magazines, but also cigarettes, chocolates, chewing gum, fiscal stamps, and tram tickets, among other useful things. Thanks to the new Tisak Paket service, it costs only 10 HRK (1.30EUR / 2CAD / 95INR / 1.44USD) to send documents, and 15 HRK (1.95EUR / 3CAD / 142INR / 2.15USD) to send packages from and to any kiosk in Croatia. They also have an international service for packages sent to a foreign address. Their website even has a 'kiosk locator' where you can find out which of the over 1000 Tisak Media kiosks across Croatia is located closest to the person you want to send a package to. They claim to offer same day service within Zagreb (if you drop off your package before 12pm), and three to six days for other cities in Croatia. This option is quite cost effective for packages, costing less than the post office. Three to six days seems a bit long for national delivery, but compared to the time it takes Hrvatska Pošta to deliver mail, it is not bad at all. Just ask the bus driver! The other way to send a package is via the bus driver. This is definitely the fastest and most cost effective way to get a package to a friend or family member. I was reminded of this Croatian 'tradition' recently when I took the bus from Pazin to Zagreb. A lady got on with a package – something wrapped in a plastic bag. She asked the driver if he could hand it over to her niece who would be waiting at the bus station in Rijeka, where we would be stopping on our way. She also passed him some money, saying “This is for your marenda.” He took the package but refused the money, answering that he doesn't take payment from neighbours. One hour later, the package was handed over at Rijeka bus station. That's what you can call express delivery! Cost: free. I remember seeing many similar transactions on bus trips when I used to visit as a child and we would travel all over Istria by bus visiting family. I also remember overhearing aunts saying that they would “send it with the bus driver”. At that time, there used to be many more buses travelling between cities and towns across Istria and beyond, and people used to use this cheap and very reliable way of sending things to family and friends in other cities. Drivers would also make a little bit of extra money this way, accepting 'tips' for the 'express delivery' service they were providing. It's nice to see that this tradition continues! So, if like me, you're frustrated with the Croatian postal service, know that there are other, more reliable – and cheaper! – options. While living in India I observed how long-distance bus drivers in India also make extra cash – much more than just tips – by transporting 'unofficial' shipments on bus routes. ...Like the time when I was travelling on a bus from Bangalore to Pondicherry and we made an unscheduled stop on the way. You can read about it here.